Rain quenches the thirst of soils and vegetation, fuelling ecosystems and much of the world’s agriculture. Whether it ruins a day on the beach or destroys a season’s harvest, it makes humans deeply aware of their vulnerability to the vagaries of the atmosphere. It’s important to understand how rainfall changes in a changing climate. Here, I will describe the issues in understanding precipitation changes and how two recent papers help to solve the puzzle. Predicting rainfall is difficult. It is a small-scale phenomenon, especially in the towers of convective cloud in the Tropics. Weather forecasting models are just beginning to capture them properly at scales of a kilometre or so, but climate models, which have to be run for decades rather than days, calculate atmospheric conditions on scales of hundreds of kilometres. Rainfall has to be simplified in these models, since we cannot calculate the physical properties of individual clouds. These simplified representations are called parameterisations. A precipitation parameterisation relates the average rainfall over a large area to the average amount of water in the air. Different models do this in different ways and, because it’s a simplification, there is no definitive ‘right’ way. This means there is some disagreement among climate models about how rainfall will change in the future, especially in the Tropics (areas on the figure which are not stippled). 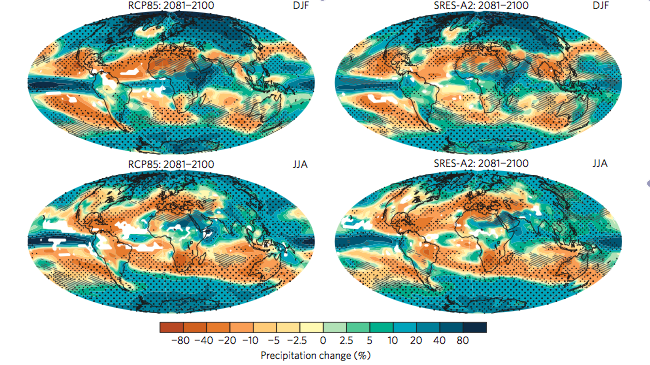 Climate model projections of precipitation change in a future with high greenhouse gas emissions. Left: current generation of models, Right: previous generation of models (around 2005). Top: December-February, Bottom: June-August. Stippling shows areas where models largely agree. White areas show complete disagreement among models (source: Knutti & Sedlacek, 2013). If we think about precipitation in general theoretical terms, we can find laws which must be followed and use them to make predictions, as Issac Held & Brian Soden did in their study of how the hydrological cycle responds to global warming. Rain is caused by the upward transport of water vapour from the surface into the atmosphere, where it condenses, forms clouds and rains out. The amount of moisture going up must, of course, balance the amount coming back down as rain. As the climate warms, the amount of water vapour a fixed mass of air can hold increases. This means that, as long as the circulations transporting water upwards remain the same, the total amount of water vapour going upwards must increase – which means the amount of rain coming down must also increase. This is called the ‘rich get richer’ mechanism, because it increases rainfall in regions where there is already a lot of rain driven by upward moisture transport. It’s a fundamental mechanism driven by thermodynamic laws…but that doesn’t mean it’s the only thing going on. 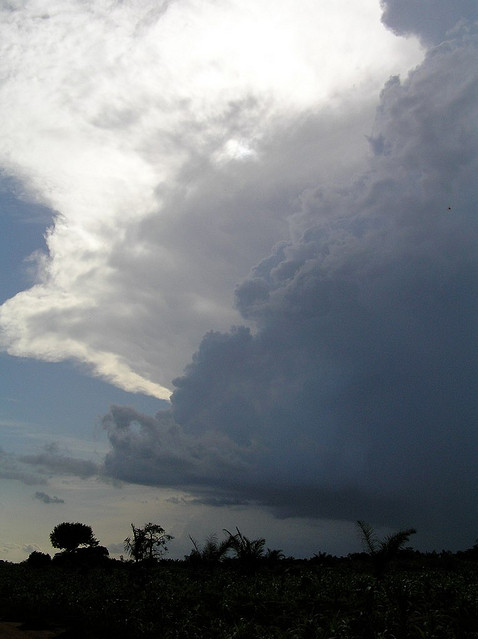 Convective raincloud in tropical Africa (photo credit: Jeff Attaway). If climate model projections followed the ‘rich get richer’ mechanism, precipitation would increase most in the regions with the most precipitation currently. In fact it is more complicated than that. Robin Chadwick and his colleagues explored the effect of weaker vertical motions in a warmer climate. We can understand this by thinking about what carbon dioxide does to the vertical temperature profile. It warms the mid-troposphere (about 5 km up) more than the surface. To get convective upward motion, the air at the surface must be less dense (i.e. warmer) than the air above. Warming the air aloft suppresses this motion. The Chadwick decomposition calculates the part of the precipitation changes caused by changes in moisture (which goes at about 7% per K) and the part caused by the reduction in upward transport. They find the two tend to roughly cancel each other out, which means the spatial shifts in precipitation are determined by changing patterns of surface temperature (since warm surfaces produce upward motion). Sandrine Bony and her team decompose precipitation changes into two main components rather than three: one is the ‘dynamical’ component, associated with changing upward motions, and the other is the ‘thermodynamical’ component, including changes in atmospheric moisture content. Unlike the Chadwick method, the thermodynamical component is not designed solely to represent the ‘rich get richer’ mechanism. This means the thermodynamical component isn’t just a 7% per K increase; it includes things like the spatial changes in surface temperature. The dynamical component isolates the change in precipitation caused by changes in upward motion. 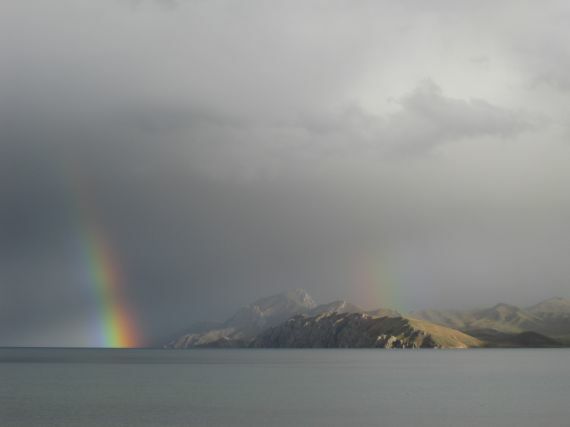 Monsoon raincloud over a lake in the Tibetan Plateau (photo credit: Janneke Ijmker). The ‘rich get richer’ rule of thumb becomes increasingly irrelevant at smaller scales. This is frustrating, because these are the scales we really care about! It’s not particularly useful knowing what will happen in a general sense over the whole Tropical region. Farmers want to know what will happen to the seasonal rains on their small piece of land. Bony also points out that geoengineering schemes which aim to reduce incoming solar radiation to cool the planet’s surface would leave the dynamical component of precipitation change untouched. This is because the dynamical component is caused by the warming of the mid-troposphere by carbon dioxide, and this remains even if we cool the surface. It is an example of the inexact nature of the cancellation between carbon dioxide increases and geoengineering schemes to decrease the amount of carbon dioxide in the atmosphere, and demonstrates that the only way to stop carbon dioxide-driven climate change properly is to stop emitting carbon dioxide. Bony and Chadwick’s decompositions show how one can glean a lot more information from climate model projections than one would expect from first glance. We have established some general facts about climate change related to the Earth’s energy budget. In that sense we understand quite well what will happen in a warming climate. However, there is still a lot of diversity between model projections, most of which comes from differences in the dynamical response. Local changes in rainfall are related to changes in circulation, and this is the area in which a lot more work needs to be done.